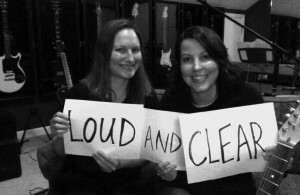 We are pleased to announce that Loud and Clear is the title of Folkstar’s forthcoming sophomore album release. We speak our minds on this album, with songs covering life and death, suicide and dreams, the flaws of our society and the beauty of our world. The title track tells the story of Sue’s hearing loss. It also talks about a “wake up call” which is a common theme throughout the album. Loud and Clear is a huge 16-track album, by far more ambitious and bold than anything we’ve done in our lives. We never thought we’d have the guts to tackle teen bullying and suicide in the song “It Gets Better” (for the It Gets Better Project). We’re taking risks exposing our manufactured lives in “Fabrication” and “Everybody Knows.” We even explore animal exploitation in “Human” and through a jazz number called “Abolitionists.” Crowd favorite and epic song about love and dreams “Could You Be” is on there as well, along with another epic song about how we give up our dreams called “Dream Thieves.” We also wrote about death in “Final Curtain,” as well as “New Eyes,” which is about losing someone you love dearly and trying to find meaning in the despair. Of course there are still songs about love such as “Trampoline” and “Ice Queen,” reminiscent of our debut album Emotional Bootcamp. No album would be complete without including the topic that is really the origin of all writing, songs, and poetry. You’ll still hear some of our folk roots come through on songs such as “Outcast,” but we think most of Loud and Clear is much more rockin’ than our last album. We’re not sure you can call us folk-rock after some of these songs. Perhaps we’ll go more folky on our next album! We’ve also got some extra fun instrumentation on here. For instance, you’ll get to hear Kim play trumpet! Did you know that Kim’s first instrument was the trumpet? Well, now you’ll get to hear her play on record! We’ve also got some interesting sound effects on the title track that mimic the distortion Sue hears in her left ear. Plus, we’ve got stellar guest appearances! Dylan Linehan tears it up on piano on “Dream Thieves” and she’ll make you cry on “Afterglow.” Leslie Wiegle’s beautiful voice can be heard on “Something New” and “Afterglow.” Nic Martinez rocks the bass on “Natural High.” And Preston Luce lends his sweet cello work on “Afterglow.” Are we giving too much away? Besides writing about our experiences and what’s on our minds as usual, some of the inspiration for Loud and Clear came from listening to the radio. We feel music really lacks substance these days. Maybe all of life does. Maybe we’re just too absorbed in frivolous entertainment to care. We wanted to put something out there that meant a little more. We decided to allow ourselves to take that risk. We should be able to be bold and say how we feel, as it is the mark of true artistry. An even larger portion of the inspiration for Loud and Clear came from living our dreams. Like most people, we spent most of our lives ignoring our dreams and pushing down what we really wanted to do with our lives. That’s been impossible to continue to do while working on these songs. We may have ignored signs in the past that exposed our true paths in life, and we may continue to do so on certain levels because we are still flawed. But we are stepping out now, standing tall, and telling it all, loudly and clearly.